Home / Cars / Competitions / Fancy a gold S-Class for the weekend? Fancy a gold S-Class for the weekend? Mercedes-Benz have just launched a fun competition called Oman Sees Gold. Essentially, an exclusive gold version of the Middle East car of the year, the S-Class, is rolling around the capital between now and the 23rd of May. Think of it as a big version of hide and seek! If you are a resident, or citizen, of Oman, you can try your luck at being picked to have the gold motor for a weekend. 3 people, for 1 weekend each will get to have the test drive. 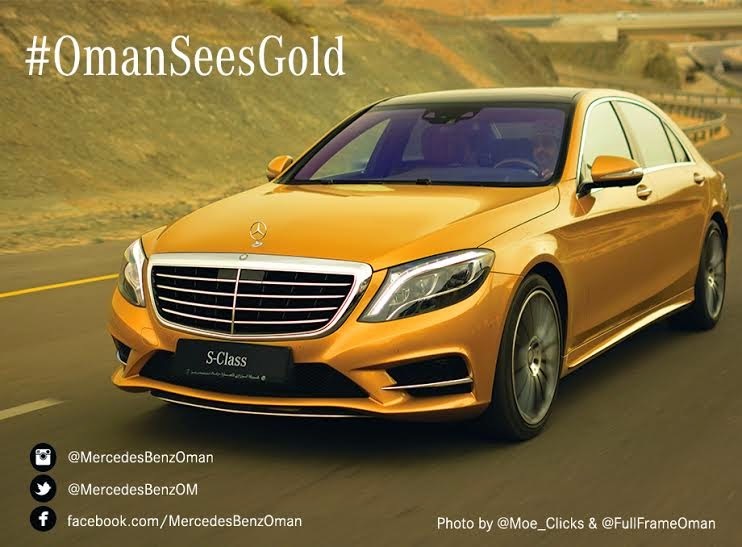 All you need to do is take a selfie with the car and upload it to Twitter, Instagram or Facebook with the hashtag #OmanSeesGold - you also need to be a fan of Mercedes-Benz Oman on either Facebook, Twitter or Instagram (click the links for your preferred social platform). The three winners will be announced once the competition closes on the 23rd of May and there is no limit to the number of selfies you post... in case you really like Gold cars! That is a really stunning piece of automobile indeed. If only I was around the contest area I would post my selfies countlessly and spam their social media accounts. Sadly, I can only admire the unique car from far. A car is a comfortable way to stay mobile but to be in a golden car is once-in-a-lifetime experience. It looks like a moving pod from space in that colour.